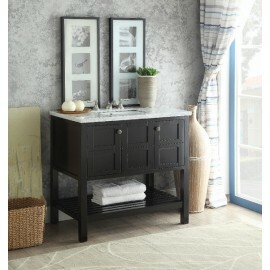 Add a petite classic design Teega your bathroom with this space-saving bathroom vanity from Benton Collection. The luscious, antique white Teega sink vanity is ideal for those seeking to furnish their bathroom with an elegant, yet non-intrusive piece. The polished white marble counter top sharply compliments the refreshing antique white finish. The petite Teega sink vanity is sure to transform any compact bathroom into a space of luxury.